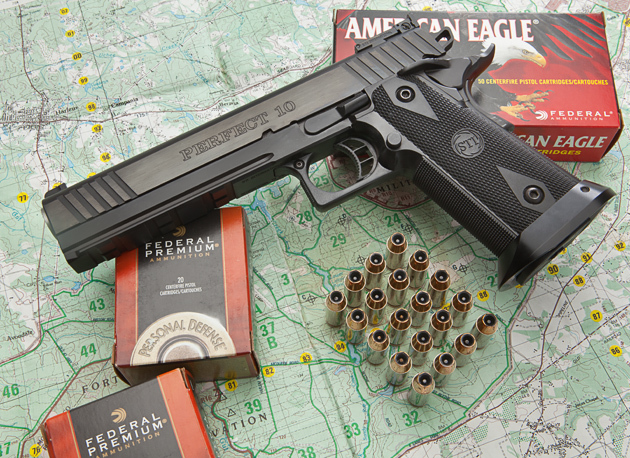 This entry was posted in ammunition, pistol, self-defense, weapon and tagged 10mm, 1911, 2011, AllOutdoor. Bookmark the permalink. I have a friend with an original Colt Delta model (Elite?) , it is fun to shoot, but recoil is pretty stiff, not something I’m used to in an automatic. He only takes it out on special occasions – ammunition cost is pretty high. You get used to it, and as stated in the article, reloading for the ten isn’t significantly more expensive than a .40. Only true if you can find 10mm brass. I want a 10mm the way some people lust after Shiloh Sharps. I wonder if you could get one of these with a .40 barrel for fun, and 10mm for love…. Hmm. Yeah; I took shipment of a thousand more cases from Starline this spring, but now I see they’re out. Save your empties. Also I suspect if you load 10mm to its full potential its a bit harder on said brass than .40 so you’ll be tossing brass in the scrap bucket a lot sooner than .40. I was pre-disposed to liking the 10mm from the start, my 1st big bore was the .41 Magnum Ruger Blackhawk. Due to lightweight – compact 4 5/8″ barrel (not available in .44 Magnum from Ruger at the time), its been a long time love affair. I really like the bore. The .41 AE was another ‘coulda been a contender’, a switch barrel 9mm / .41 bore autoloader would have been great. Yes; the Glock barrel (my older, First Gen. one at least) is especially hard on brass with full power loads. Many reloaders have warned about this, but some of the loading manuals also warn about the same thing in the 40 S&W section. The LW barrel offers a little bit more support, though the feedramp design requires some relief at the bottom, rear portion of the chamber, regardless. It’s right there that the cases tend to want to bulge. LW has reduced that relief to its physical/mechanical minimum. I don’t know about the Colt or Smith & Wesson, or the Kimber in that regard. A revolver chamber would offer much better support in the web area. You just have to inspect your used cases closely. My main case loss now comes from the fact that I often shoot in wild areas, where there may be tall grass or brush, or deep snow, and so I just don’t find them all. Also, Glocks tend to dent the cases against the corner of the ejection port, at or near the outer corner of the extractor on the slide, though this dent is small and farther forward on the case where there is good case support in the chamber. So I don’t worry about that one. I have an original Colt Delta, with defense loads the recoil is stiff. I changed out the original spring configuration ( Dual springs with a plastic guide) with a Wolf 20# spring and standard recoil spring guide. Stiffer spring tames the recoil but makes the gun more difficult to charge. Shooting with the American Eagle loads is quite pleasant with the new spring setup. I’m still experimenting with 200 grain cast bullets in a Glock 20 with Lone Wolf Barrel, loaded near to full power. Come to think of it, I need to get out and try a bunch more of them. Not to be an internet member of ninja force alpha, but what’s the deal with the first pic in that article where both of her index fingers are in the trigger guard??? No idea! I only noticed it in reviewing the photos. She didn’t do it when I was coaching, but did for some strange reason when shooting with others. Another happy Delta Elite owner.